The clash at a highly-charged meeting in Brussels left Mr Barnier “absolutely furious”, according to Brussels sources. The heated exchanges last month occurred when Mr Raab and Mr Barnier met for just the second time. Progress on the Irish border issue since then has been “close to zero”, insiders said. Mr Barnier has repeatedly rejected UK proposals for avoiding a hard border such as using technology and exemptions to create an invisible border or a “dual tariff” customs partnership. 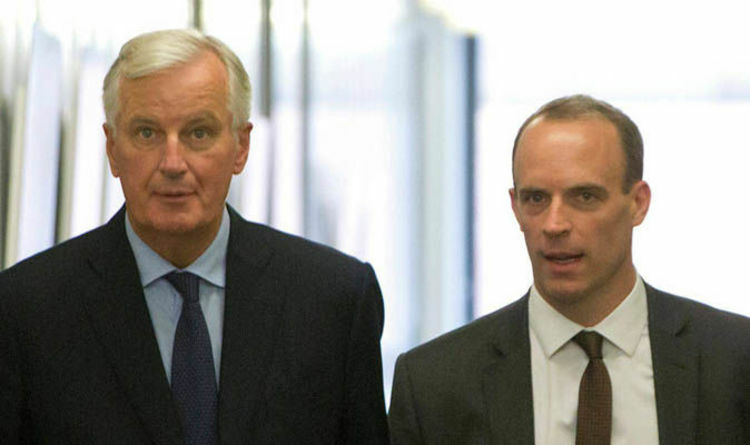 Mr Raab attended a further two-hour meeting in Brussels yesterday but left without holding the customary joint press conference with Mr Barnier. EU sources said there had been no conference “because there wasn’t much more to say”. Former UK ambassador to Brussels Sir Ivan Rogers warned in Dublin that the risk of an “accidental” no deal was rising. Last night former US president Bill Clinton said during a visit to Dublin that the UK’s divorce from Europe was hindering the restoration of Northern Ireland’s devolved government.